Black Arts Toneworks Pharaoh Supreme Review – Best Fuzz Distortion Pedal? The Black Arts Toneworks Pharaoh Supreme is the final evolution of the legendary Pharaoh fuzz distortion pedal. The Pharaoh has long been known for its plethora of musical fuzz tones that forge a link between your guitar and amp without masking the inherent character of each. This rich legacy of tone has led many guitarists to bow down to the Pharaoh, extending its dynasty across pedalboards the world over. Now the Pharaoh Supreme ascends to the Osirian throne, promising all the tones and sounds of the original Pharaoh and more. Will it rule supreme as the best fuzz distortion pedal? The answer will be revealed in our Black Arts Toneworks Pharaoh Supreme review. There are a few distinctions between the Pharaoh and Pharaoh Supreme pedals. The Pharaoh is already an incredibly versatile fuzz distortion pedal, but the Pharaoh Supreme appears to be for those who want even more. While the Pharaoh has 3 clipping modes (asymmetrical Germanium, Silicon, and no clipping), each selectable via a 3-position flip-switch, the Pharaoh Supreme features those 3 modes plus 3 more (Germanium, Mosfect and LED), all 6 selectable from a 6-position rotary knob. Also, while the Pharaoh had a 2-position Hi/Lo switch that lets you select from tones with more headroom/lessing clipping or less headroom/more clipping, the Pharaoh Supreme replaces it with a Pre knob for even deeper contouring between those tonal characteristics. Here’s the full list of features before we jump into our Black Arts Toneworks Pharaoh Supreme review. Fuzz control knob sets fuzz distortion level from a cleanish boost, to a light overdrive, all the way to saturated fuzz. Tone control knob adjusts tonality, designed to suffer little volume loss and give a natural sound. Volume control knob sets output level. High control knob replenishes highs cut by the Tone control when boosting lows. Pre control knob replaces the Hi/Lo switch of the standard Pharaoh and adjusts the front-end saturation between tones with more headroom/less clipping and less headroom/more clipping. Clip 6-position rotary knob selects from 6 different clipping stages, from left to right: Germanium, Asymmetrical Germanium (standard Pharaoh), Silicon (standard Pharaoh), Mosfet, LED, and Bypass (standard Pharaoh). True bypass foot-switch for letting your signal pass unaffected when disengaged. Powered by 9VDC power adapter. Visit Black Arts Toneworks for more info about the Pharaoh Supreme. Do yourself a favor. Don’t bother reading this review. Go ahead and send a check to Black Arts Toneworks with a note that says: “I want to serve the Pharaoh Supreme.” You can thank me later. What, you want more convincing? Fine. Watch the Pharaoh Supreme review demo video. Then send your check to Black Arts Toneworks. You’re still here? You must really want me to tell you about the Pharaoh Supreme, huh? If you haven’t played the standard Pharaoh fuzz distortion pedal due to living under a rock or other territory outside the jurisdiction of the Pharaoh’s epic fuzz majesty, you’ve been missing out. The standard Pharaoh offers a choice of Asymmetrical Germanium clipping, Silicon clipping, or no clipping in a single pedal for those who appreciate the subtle variations of one over the other or just like a little more variety out of life. The Pharaoh also has a Hi/Lo switch for shaping the overall response of the pedal considerably. The standard Pharaoh simply rocks and is a formidable fuzz pedal in its own right as the many Pharaoh worshipping guitar players and bassists will agree. 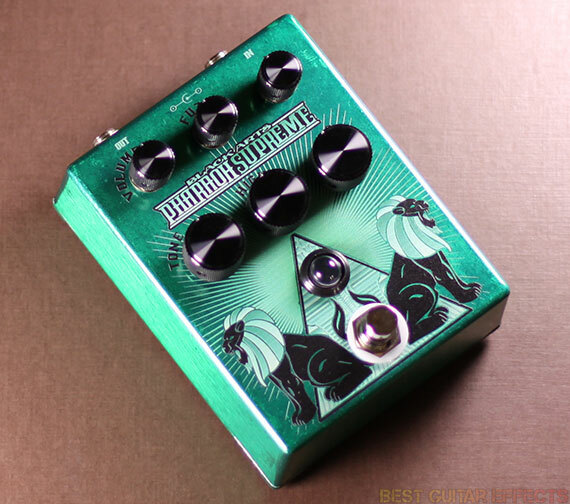 The Pharaoh Supreme differs from the standard Pharaoh by offering 3 more clipping modes: Germanium, Mosfet, and LED. That gives you a total a 6 selectable clipping variations! Also, in place of the Pharaoh’s Hi/Lo switch is a Pre control which adjusts between those 2 settings and anything in between. The Pharaoh Supreme’s 3 additional clipping stages will be more than worthwhile for some guitarists. The Germanium clipping sounds quite similar to the Asymmetrical Germanium clipping with the latter having slightly sharper edges. The Pharaoh Supreme exclusive Mosfet and LED clipping settings are my 2 favorites among all 6 modes, making the Pharaoh Supreme my preferred choice among the Pharaohs. The Mosfet clipping just has this even dynamic response and definition that I really appreciate. The LED clipping has the most distinct sound from the rest of the clipping modes and provides a different foundation for sculpting your perfect fuzz distortion tone. The differences among the clipping modes may seem somewhat subtle at first, especially when playing with high Fuzz levels, but really listening to how the various controls interact with the different clipping modes will reveal their unique qualities and yield the best results. The Pre knob may look like a minor alteration to the Pharaoh design, but it has a surprisingly essential impact for helping you get the most out of the Pharaoh Supreme. Especially noticeable is how at its highest settings, the Pre knob really pushes the clipping to achieve maximum breakup. But you can just barely cut it back and shave off a little harshness from your overall sound if you’d like. This control is highly interactive with the various clipping modes and is not to be overlooked when tweaking your Supreme fuzz tone. Carried over from the standard Pharaoh is the brilliant combination of Tone and High knobs. When you have the Tone rolled clockwise, the High knob has little noticeable effect on the sound. But when you turn the Tone counter-clockwise, darkening the sound and reducing the high-end focus, the High knob can be turned clockwise to bring back the high-end. It’s a remarkably clever approach that yields some incredibly thick fuzz sounds. In the review video I mainly found myself showing the Tone knob at extreme settings, but definitely try setting the Tone between 9-12 o’clock with the High cranked for some killer tones that aren’t too bass heavy. 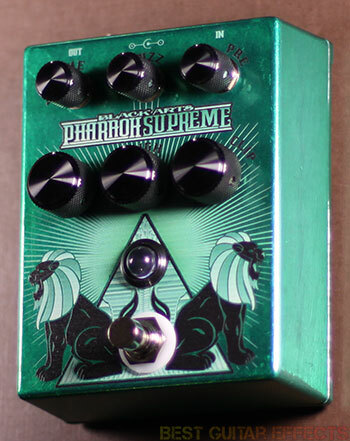 Either way, the Pharaoh always has a beefy mid-range presence for a massive fuzz assault. Reducing the Fuzz produces some great mellow fuzz tones, cleanish overdrive sounds, and mild distortion. The Pharaoh Supreme delivers some very smooth overdriven tones if you don’t want it all extreme all the time. There’s some solid cleanup from your guitar’s volume control as well. The pedal’s Volume knob can really crank your signal, too, if you need a boost. The Pharaoh Supreme also stacks amazingly well thanks to it’s wide selection of clipping modes and tone variations, making it a killer choice for a lead boost in front of another distortion pedal or your amp’s crunch channel. The Pharaoh Supreme really is one of the more versatile fuzz distortion pedals I’ve played, and while you can easily kick it on and quickly find a usable setting, you’ll discover new levels of fuzz supremacy over time as you discover all the subtle nuances of this pedal. All the tones of the standard Pharaoh are intact in the Pharaoh Supreme, but the Pharaoh Supreme’s 3 additional clipping modes and unique Pre control make for a tempting sonic upgrade. This is the fuzz to rule over your other guitar pedals. The Black Arts Toneworks Pharaoh Supreme rules and is one of the best fuzz pedals around. Let’s see the final result. The Black Arts Toneworks Pharaoh Supreme is one of most fun and intricately musical fuzz pedals I’ve played and will surely become one of my go-to fuzz boxes. Its 6 selectable clipping options provide plenty of starting points for shaping some killer fuzz tones. The masterfully designed tone circuit from the standard Pharaoh still reigns supreme and works well with the newly implemented Pre knob for putting the final touches on your fuzz distortion masterpiece. 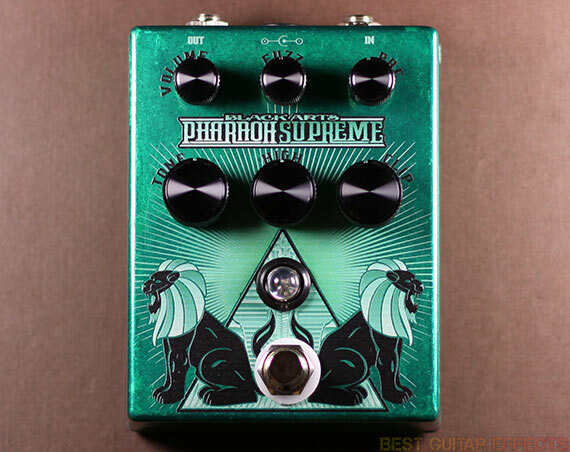 The LED and Mosfet options make this the Pharaoh of choice for me, and if you’re looking for the best fuzz distortion pedal around, perhaps the Pharaoh Supreme will serve your needs as well. That concludes our Black Arts Toneworks Pharaoh Supreme review. Thanks for reading. Want to buy the Black Arts Toneworks Pharaoh Supreme?